Receive one of these incredible monthly gluten free subscription boxes that’ll make you love being gluten free more and more every month. Here’s the complete list of all the best gluten free subscription boxes that you should definitely subscribe to. Whether if it’s healthy snack boxes or full meals, you’ll find everything in the gluten free monthly box listing. Below you’ll find our complete listing of gluten free monthly subscription boxes. And don’t forget to take advantage of some of their killer coupons! What it costs: $9 to $49 a month. 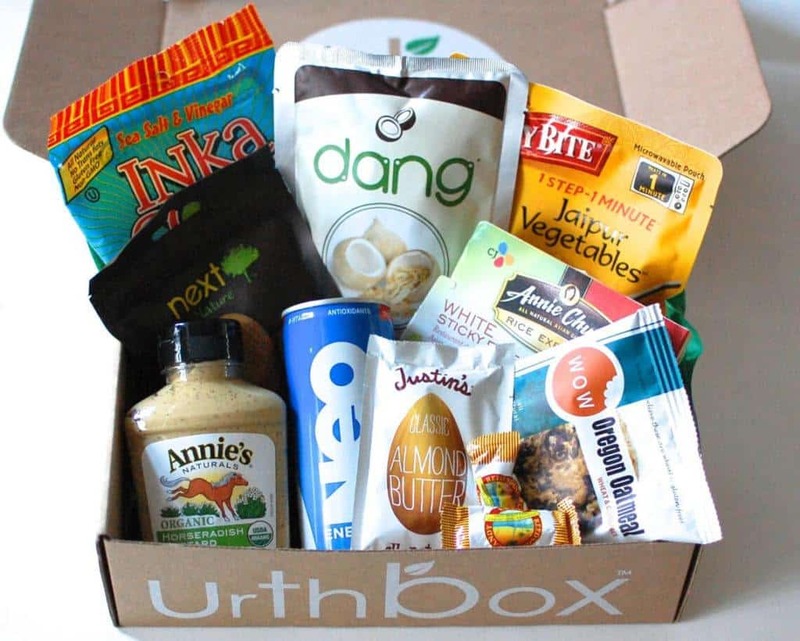 What you get: The one thing that separates this Urthbox from the rest of the gluten free monthly subscription box companies out there is the fact that you can purchase multiple sizes of the boxes based on how many organic gluten free goodies you’ll like to receive that month. In some boxes, you can receive upwards of 49 different gluten free, full sized products! Coupon / Buy Now: Use this code Urbantastebud and get $10 off your gluten free box by clicking here. What you get: In every gluten free Love With Food box, you will get 8 to 12 organic and all natural gluten free snacks. Plus with every Love With Food box that you buy, Love with food will donate 2 meals to hungry kids in America. Such a great cause! Coupon / Buy Now: Get 25% off your next gluten free box by clicking here. What it costs: $24.95 – $36.95 a month depending on the box you choose. What you get: With an American Gluten Free monthly subscription, you have the choice of 2 great boxes: The Foodie Box (which contains more gluten free meal, cooking, and baking based products) and the Discovery Box (which contains gluten free snacks perfect for someone on the go). And best of all, all the products are free of artificial flavors, chemicals, and dairy. Coupon / Buy Now: Join Vegan Cuts by clicking here. What you get: Every week with a Freshly subscription, you’ll receive healthy and fresh (never frozen) chef prepared meals that are ready in under 3 minutes. And best of all, every Freshly meal is naturally gluten free and peanut-free. How much is it: $24 a month. What you get: Get 12-15 unique and delicious 100% gluten free snacks in every monthly box. What it costs: $42.49 a box. What you get: Every month, get an assortment of delicious gluten free and healthy full sized snacks delivered straight to your door. Coupon / Buy Now: Click here to get a Healthy Surprise snack box. What you get: With Paleo by Maileo, you’ll get 5-8 tasty paleo snacks and goodies like cookies, chocolates, jerkies, dried fruit, nut mixes, bars, and so much more delivered monthly. Coupon / Buy Now: Use the code SNACKATTACK to get $5 off HERE. What it costs: $50 a box. What you get: With this box by Quarterly, every 3 months, Melissa sends her paleo favorites to help you eat clean, train hard, and live loud. Coupon / Buy Now: Click here to get Melissa’s box. What you get: With the Nums-Nums Munch Box, you’ll get a box filled with delicious dairy free and gluten free goodies. And the best part about it is that every month, the assortment of goods are always different. What you get: With Tasterie, you’ll get dairy free, gluten free, and wheat free goodies, delivered to your door, on the first of every month. This monthly box is ideally suited for people who have a dairy allergy or lactose intolerance and gluten allergy, wheat allergy, gluten intolerance or gluten sensitivity. Coupon / Buy Now: Click here to join Tasterie. What it costs: $18.90 a month. What you get: Get a customized box of macarons delivered straight to your door each month. To get started, just choose from 20 delicious flavors to fill up your monthly macaron box. Best of all, they are all gluten free, dairy free and under 50 calories each. What it costs: $29.95 – $49.95 a month. What you get: With Picky Bars, you’ll get deliciously healthy bars delivered to your door every month when you join the Picky Club. Just pick your quantity, flavor, and shirt size and that’s it! This is an excellent snack for athletes and healthy folks alike. What you get: Get 5-7 hand-curated gluten free snacks, supplements, and protein powders, all of which are protein packed and free of any artificial preservatives, flavors, colors, or sweeteners. What it costs: $19.99 a month for 4 bags. What you get: Every month when you subscribe to Gatherer’s Granola, you’ll get four 9oz bags of gourmet granola made from locally sourced and natural ingredients. Best of all, select granola are certified gluten free and non-GMO. What it costs: $30 every month. What you get: In every Send Me Gluten Free Box, you’ll get 8 to 12 new gluten free products to try that will also at least 1 full-sized gluten free item. Plus, in every box, you’ll also get full-sized and sample sized food, personal care items, supplements and household products that support your gluten free diet and lifestyle. Click here to get yours! Coupon / Buy Now: Save 50% off your first order when you click here. What it costs: $37.95 a month. What you get: With Hey Gluten Free, you’ll get an surprising assortment of hand picked gluten free goodies delivered straight to your doorstep. This also makes a pretty tasty gift. Coupon / Buy Now: Join Hey Gluten Free here. Thanks for reading and hopefully you find the perfect gluten free monthly subscription box! Plus, don’t forget to check out our gluten free makeup subscription box article where you’re also find some killer beauty boxes for under $10 a month! How would I get these gluten free grocery boxes delivered to my house.